I went on vacation last week! For the whole week! Man, it was awesome. Getting back to work and reality is kind of a bummer this week. But I get to relive it a little bit with my food recap posts. Score. For our Vegas trip we had four of us tagging along – myself, Jake, Chris and Laura. 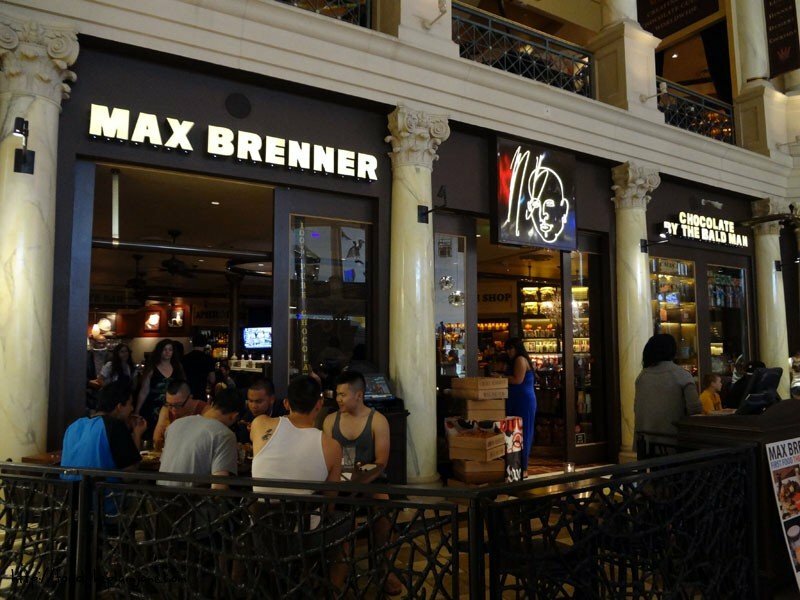 I had read a few other blogger’s posts about visiting Max Brenner in Las Vegas – a restaurant that also has a chocolate shop within it and a separate “Chocolate Menu”. I couldn’t resist. I got to pick a couple of dishes because my friends are cool like that and trust my judgement. I got consensus though. We shared all of our dishes so it was like we all shared a mini buffet together – but this way the food was fresh and a bit more interesting that the items you’d get at the buffet. 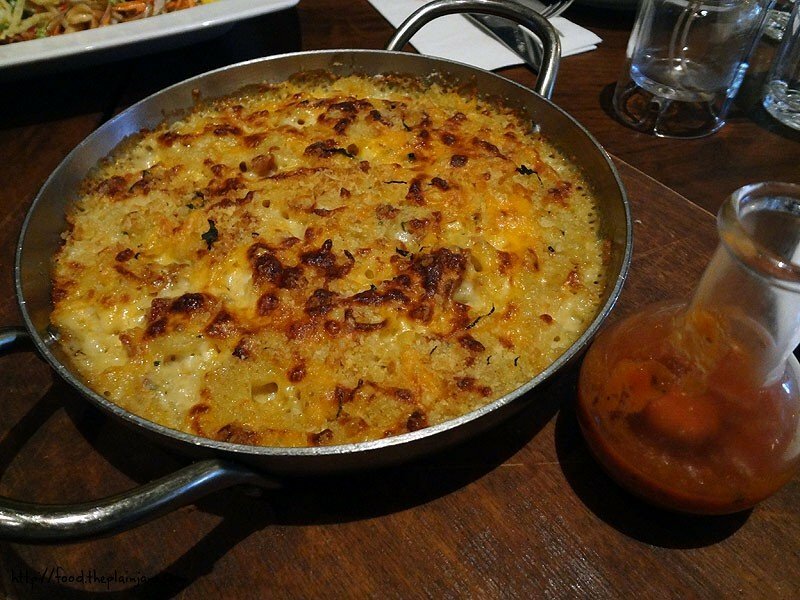 One of the dishes we started off with was this Mac & Cheese dish – it is true to its name in that it was pretty crunchy. It’s not really a very saucy or creamy mac and cheese but still quite good on it’s own. The top got very crisp and crunchy, lending a nice texture to the dish. I prefer a little creamier mac and cheese, but I still loved the crunch on this one and the blend of cheeses was quite nice. I also picked a salad to lighten up the meal since mac & cheese can be heavy at times. This Asian Chicken and Soba Noodle Salad really hit the spot and surprised all of us at how good it was. 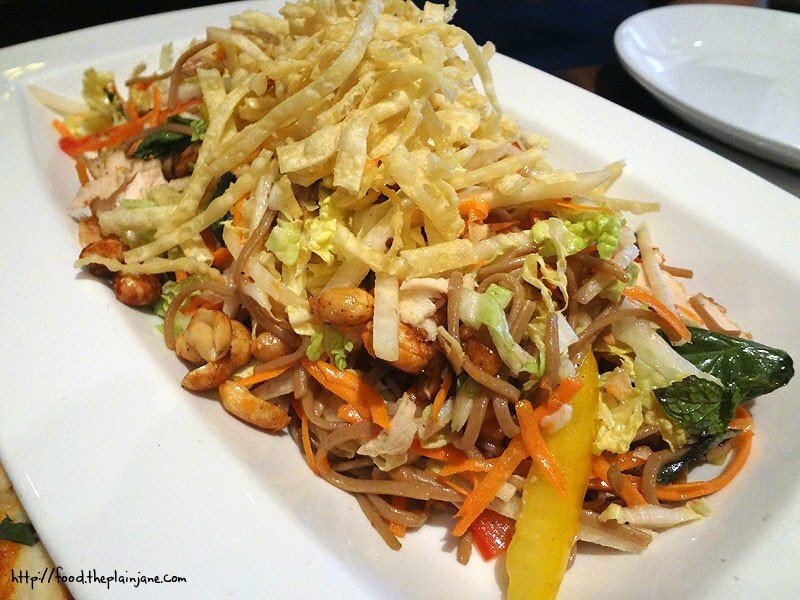 It was a nice, light, refreshing salad that had a lot of textures and flavors going on – the mint gave it a good flavor, the soba noodles were delicious and the crunch from the veggies, peanuts and wonton noodles really made this salad come together. We cleaned up that dish pretty quickly and it ended up being one of our favorite items. I was intrigued by the description of these white corn croquettes and decided on getting the smaller sized portion. 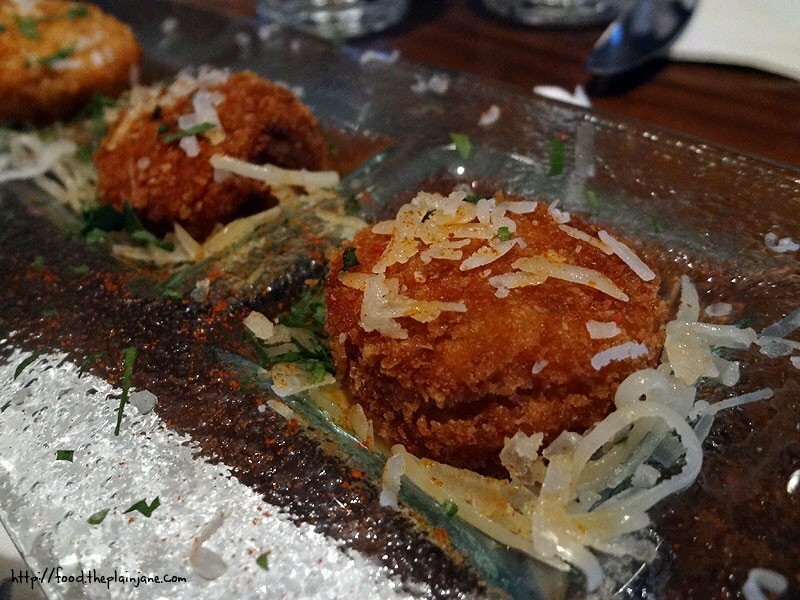 It turned out to be perfect since it came with four little croquettes – one for each of us! These croquettes are lightly fried with a creamy, cheesy inside. The white corn adds a bit of sweetness to the bite while the cheese oozes out. It’s a flavorful, crunchy little bite! Jake decided he wanted to get an order of these Thai Style Chicken Satays. 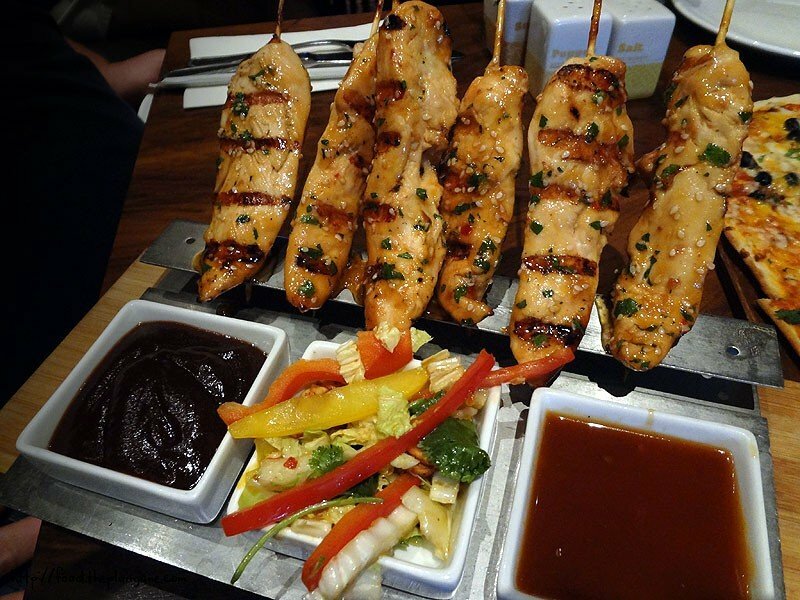 I loved the presentation on this one, with all of the chicken skewers standing up on a little tray with their sauces right below. The sauce on the left is sort of a smoky bbq sauce and the one of the right is the peanut sauce which had a slight heat to it and a good peanuty flavor. The chicken is grilled in a simple marinade. I thought they were ever so slightly dry – but once paired with a little bit of one of the sauces, they were perked back up. Laura wanted to try out this chicken and three cheese pizza. It was a flat, thin crust. 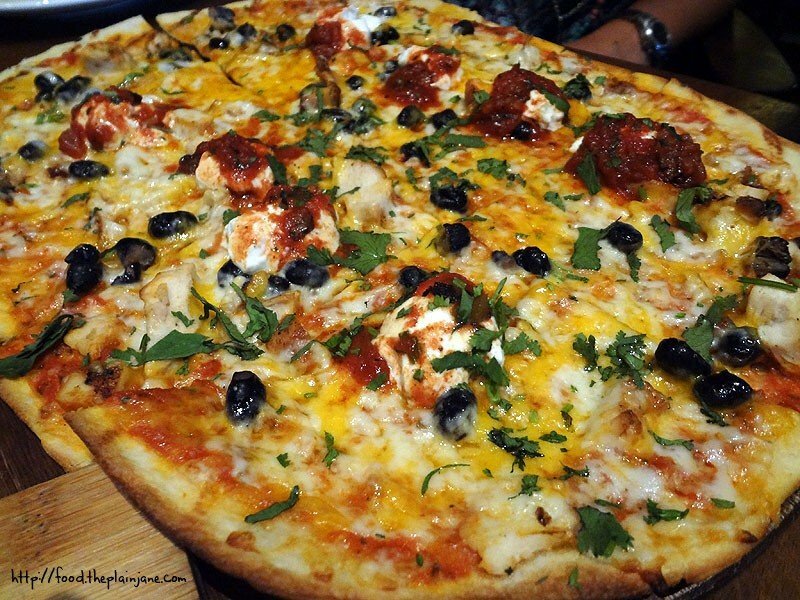 I didn’t like the cheddar or the goat cheese on this one – the goat cheese was in big globs on the pizza, making it too intense in those spots. I thought the goat cheese should be spread out a bit more and in thinner globs. I didn’t really like the crust either – very thin without much structure to it and not very crisp. I only had one piece before I went back to eating our other dishes. I decided I had to try a hot chocolate. 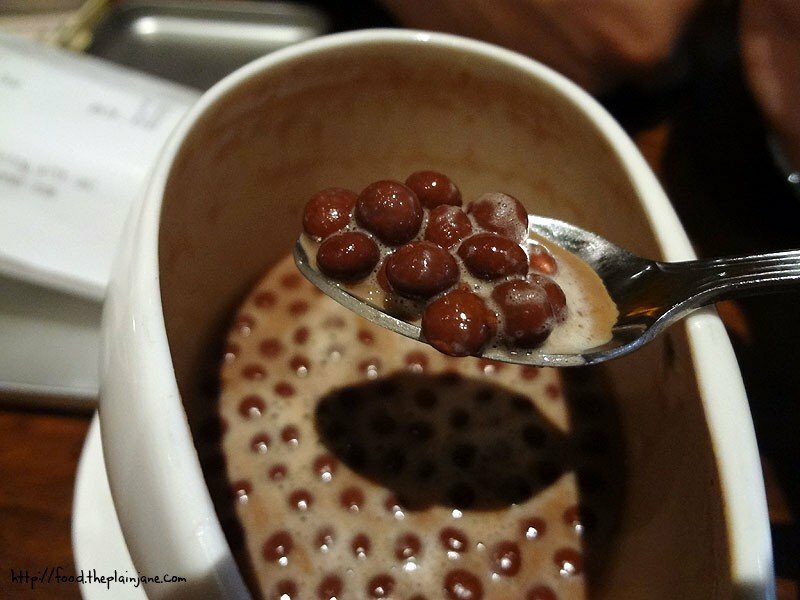 They had a bunch of different kinds (I didn’t think there could be that many kind of hot chocolate) and ended up getting this one with “Choco-Pops” in it. Choco-Pops are little chocolaty nuggets of goodness – sort of like really really small whoppers. They don’t melt all of the way in your drink, but they do add another level of sweetness to it. As I got further down into my cup, it got sweeter and sweeter. I started to just scoop the choco-pops out and eating them alone since it got really intense. I loved the HugMug too – the shape, size and everything was just so cute! I can’t believe I didn’t buy a HugMug for me to take home. Damn me. My cohorts were also nice enough to let me choose dessert, too. I read and re-read the many delicious looking items (crepes! waffles! ice cream bars! fondue!) and ultimately decided on a 1/2 sized portion of the Chocolate Chunks Pizza. A half size would be the perfect amount for the four of us – a nice endcap to a great meal with no leftovers. I chose to put hazelnut bits and peanut butter on top of the chocolate, making for a great little salty-sweet combination. The pizza dough here was a little thicker and soft and complimented the chocolate very well. It was all melted together and made for a nice rich and creamy experience. I decided that this is something I could try and recreate at home. So good! Our first foodie experience in Vegas for this trip was a great way to kick it off! The food and atmosphere were great and it was just a short walk away from where we stayed (at the Flamingo). More to come! I do love eating in Las Vegas – I also love it when fancy LA or NY places open up in Vegas. Sometimes, it seems easier to get a reservation! 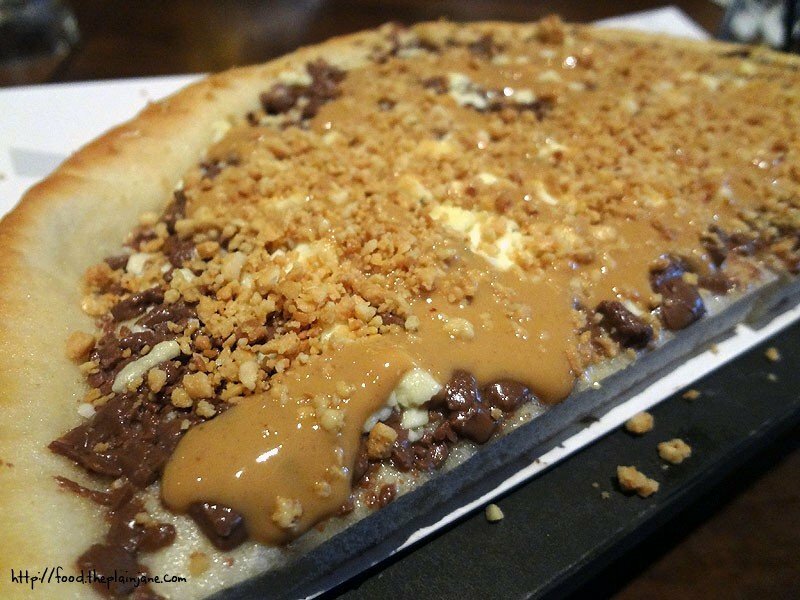 Chocolate pizza, huh? I’ve had sweet flatbreads before, so I guess a dessert pizza isn’t too far off. I have a hug mug and the cute ceramic shake mug. 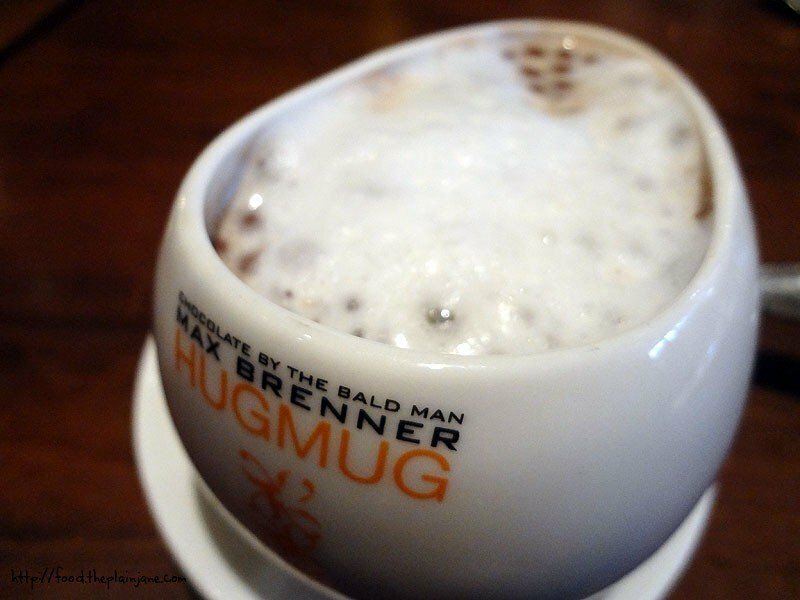 Every winter, I make sure I have at least one hot chocolate in my hug mug! Hi Leanne – The chocolate pizza was pretty good, though I think I can remake it at home. I guess we’ll see! It didn’t seem like a good idea at the time to get a hug mug, but now I really wish I had gotten one. Damn me! I must go there the next time I’m in Sin City!! 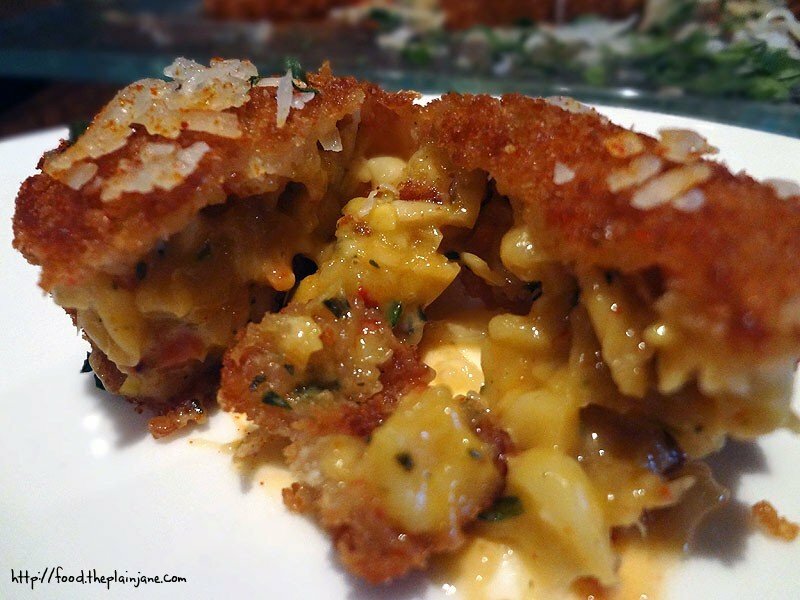 That mac and crack looks bomb-o-licious!! Hi Jenny – It was very good! Hope you get to visit it sometime! Next time I go to Vegas I want to try more off-strip restaurants. I was in Vegas a few months ago walking thru Caesars with some friends. We saw this and decided to give it a try. Were we IMPRESSED!!! Amazing entrées and fantastic desserts!!! My friends and I ended up eating here twice while in Vegas. Hi Luke – Awesome – glad to hear you had a great time! They have so many desserts to choose from it’s hard to just pick one.